But whereas most laypersons seem to think that calculation is all there is to mathematics, surely none of the greats did. Calculation was an important tool (more accurately, a set of tools) you needed to do mathematics, they must have realized, but the essence of mathematics is much more, a plateau of knowledge that transcends all the calculation techniques. In the 19th Century, that somewhat tacit understanding became explicit. The increasing complexity of the problems mathematicians tackled led to a series of results that defied the human intuition. (Several of them were referred to as “paradoxes”.) This led to an intense period of mathematical introspection, where the primary focus was not performing a calculation or computing an answer, but formulating and understanding abstract concepts and relationships. In other words, a shift in emphasis from doing to understanding. What had previously been implicit, became full-on explicit. Mathematical objects were no longer thought of as given primarily by formulas, but rather as carriers of conceptual properties. Proving something was no longer a matter of transforming terms in accordance with rules, but a process of logical deduction from concepts. Mathematics was reconceptualized as “thinking in concepts” (Denken in Begriffen). leading mathematicians such as Lejeune Dirichlet, Richard Dedekind, Augustin-Louis Cauchy, Karl Weierstrass, and Bernhard Riemann. To give just one instance of the shift, prior to the nineteenth century, mathematicians were used to the fact that a formula such as y = x2 + 3x – 5 specifies a function that produces a new number y from any given number x. Then the revolutionary Dirichlet came along and said, forget the formula and concentrate on what the function does in terms of input-output behavior. A function, according to Dirichlet, is any rule that produces new numbers from old. The rule does not have to be specified by an algebraic formula. In fact, there's no reason to restrict your attention to numbers. A function can be any rule that takes objects of one kind and produces new objects from them. If x is rational, set f(x) = 0; if x is irrational, set f(x) = 1. Of course, you cannot draw a graph of such a monster. Instead, mathematicians began to study the properties of abstract functions, specified not by some formula but by their behavior. For example, you can investigate questions such as, is the function one-one, injective, surjective, continuous, differentiable, etc.? For any mathematician alive today, mathematics is a subject that studies formally-defined concepts, with a focus on the establishment of truth (based on accepted axioms), with various forms of calculation (numerical, algebraic, set-theoretic, logical, etc.) being tools developed and used in the pursuit of those goals. That’s the only kind of mathematics we have known. Except, that is, when we were at school. By and large, the 19th Century revolution in mathematics did not permeate the world’s school systems, which remained firmly in the “mathematics is about calculation” mindset. The one attempt to bring the school system into the modern age (in the US, the UK, and a few other countries), was the 1960s “New Math”. Though well-intentioned, its rollout was disastrous, in large part because very few teachers understood what it was about – and hence could not teach it well. The confusion caused to parents (other than mathematician parents) was nicely encapsulated by the satirical songwriter and singer Tom Lehrer (who taught mathematics at Harvard, and did understand New Math), in his hilarious, and pointedly accurate, song New Math. As a result of the initial chaos, the initiative was quickly dropped, and school math remained largely unchanged while real-world uses of mathematics kept steadily changing, leaving the schools increasingly separated from the way people did math in their jobs. Eventually, the separation blew up into a full-fledged divorce. That occurred in the late 1980s. The divorce was finalized on June 23, 1988. That was the date when Steve Wolfram released his mammoth software package Mathematica. Within a few short years of that release, if not on the release-date, Mathematica (and a similar package released a few months later in Canada, Maple) could answer pretty well any school or university math exam question with at least a grade B+, and very often an A. The days when calculation (of pretty well any kind, not just numerical) was the price humans had to pay to do mathematics were over. Given that thirty years have passed since that initial epochal moment, and most of the world has still not woken up to the fact that the entire mathematical world has changed dramatically and forever, let me repeat the core of that statement in caps. THE DAYS WHEN CALCULATION WAS THE PRICE HUMANS HAD TO PAY TO DO MATHEMATICS ARE OVER. Talking about being selective, I’ve mentioned Wolfram products twice now. Though I was a member of Wolfram’s Mathematica Advisory Board in the first few years, I have no stake in or involvement with the company. While both Mathematica and Alpha were indeed major players in changing the way mathematics is done – particularly in applied settings – I am citing those particular products largely as icons, using two specific products to represent a range of new digital tools that were being developed around the world at that time. While Wolfram’s systems were ones I myself made early use of in my work, other mathematicians were also active in that digital mathematical revolution, using different systems. Still, Mathematica was the system that caught the public attention. Since the turn of the new Millennium, I doubt if anyone making professional use of mathematics in their job, or indeed any adult using mathematics in their everyday lives, has taken out paper-and-pencil and followed a classical algorithm to add, subtract, multiply or divide numbers in an array of real-life size, or perform complex algebraic reasoning to solve systems of equations, or solve problems using calculus, or any other established mathematical procedure. Not only would it now be a waste of valuable human time and energy doing something a cheap machine can do in far less time with no possibility of error, but many of the problems that people encounter in their careers and lives have simply too much data for the human mind to handle. Those same digital tools that have made the execution of mathematical procedures unnecessary have also come to dominate and drive our world, so many of the problems that require mathematics in their solution are now simply beyond human capacity. That’s why Amazon Web Services has become such a behemoth for data storage and processing. But that does not mean humans no longer need to have some mathematical skills. On the contrary, they are as crucial as ever – unless you are willing to be totally reliant on others, but personally, I have never felt comfortable doing that with things that are part of my life every day. What has changed are the specific mathematical skills required today. There are plenty of things computers cannot do or do poorly. Genuinely creative thinking and analogical reasoning are two obvious ones – though with today’s massive cloud computing resources we can use systems that provide an approximation often adequate for the purpose, and on occasion can be better than humans. Mostly, however, where you need humans is going from a real-world challenge situation to formulating one or mathematical tasks that can help you make progress. Sometimes, progress means solving a real-world problem in the sense of getting a specific answer (say, a number), but much more commonly it’s about finding a better method, where “better” can mean faster, cheaper, safer, or whatever other criterion is important, and where the change may involve developing a new method or improving an existing one. This way of using mathematics was the focus of that mini-course I gave at a California school (Nueva School) in January of this year, that I wrote about in the February, March, and April posts to this column. Though several mathematicians and mathematics education scholars expressed agreement with what I wrote, my articles brought some critiques from teachers and parents. The critiques all made reference to my asides about the Common Core State Standards in the first two of the posts. Since “Devlin’s Angle” no longer seems to be a target for the CCSS social media trolls (likely because the yield of issues to react to relative to the length and substance of most of my posts makes it less rewarding to them), I made some efforts to find out what exactly it is about the CCSSs that they objected to. 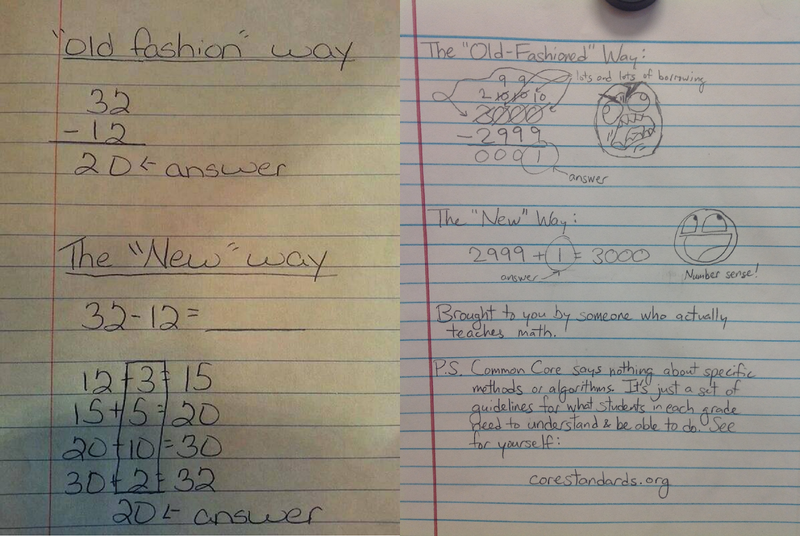 As far as I could ascertain, the issue was inevitably (and predictably) to do with particular implementations of the Standards in specific curricula or (and this seems to be the most common occurrence) claims that a particular homework exercise was a “Common Core exercise”, which of course it cannot be since the CCSS are, as the name indicates, purely a set of standards to attain, not in any way a curriculum or curriculum content. More generally, in fact, pretty well all critiques of the CCSS are due to a complete misunderstanding of what they are, why they are, and what they say. The issue was nicely dealt with in this 2014 article in the Hechinger Report. My reason for bringing the Common Core into my series of posts was to point out that the standards were developed precisely to help guide school districts, schools, and teachers in the tricky task of updating K-12 mathematics education to adequately prepare tomorrow’s citizens for life and work in a world where calculation is no longer a central pillar of mathematics. Having said that, I should point out that the above statement in no way implies that we should drop the teaching of basic arithmetic and algebra from the school system. As I discussed in some length in the third of my Nueva-inspired articles, the change that is required in K-12 math education is not so much in the mathematical topics but the reason they are now being taught and, in consequence, the way they should be taught. Teaching for execution is no longer the primary driver, since no one using mathematics in the real world does that anymore. What is now of crucial importance is teaching for understanding. Digital systems outperform humans to an insane degree when it comes to execution. But they don’t understand; people have to supply that. 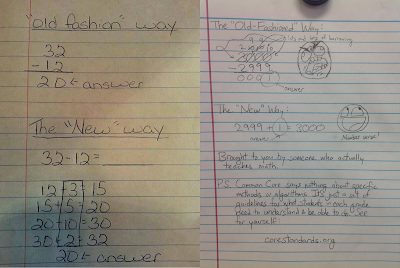 Typical social media posts about Common Core mathematics. I have three comments about the post on the left. First, the mathematics in the bottom left is not some fancy new algorithm, it is what a child wrote down in reasoning (sensibly) about a particular arithmetic problem. Second, if you are unable to follow what the child is doing, you would have trouble making effective use of mathematics in today’s world. It’s pretty basic. (Your kid just did it, right?) Third, if you are a parent and you don’t see why it is important that today’s school students acquire those math reasoning skills, please don’t communicate your skepticism to your children. Doing so would be a great disservice, to your child, to your child’s math teacher, and to society. The mathematical world has changed significantly. That occurred over twenty years ago. It is not going to change back. Sit back, relax, be encouraging, and let the kids take over. They do just fine with it. REFERENCE: During the period when the computer revolutionized how mathematics is done, I edited the American Mathematical Society’s “Computers and Mathematics” section of their monthly notices publication, sent to all members. I wrote about the column and that period in general in a paper that I submitted to the Proceedings of the Jon Borwein Commemorative Conference, held in 2017. Borwein, who died tragically young in 2016, was a leading pioneer in bringing digital technologies into mathematics. You can access a preprint of the paper HERE.